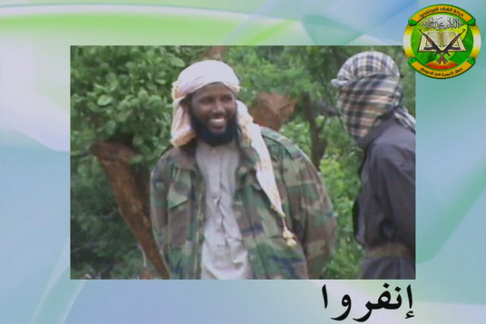 Shabaab spokesman Mukhtar Robow (left) and Saleh Ali Saleh Nabhan (faced covered) from Shabaab’s latest videotape. Image by Nick Grace. Shabaab, the Young Mujahideen Movement in Somalia, has reached out to al Qaeda senior leadership in an effort to better integrate with the network and its strategic nodes across Africa and the Middle East. The effort came in the form of a 24-minute video that features Kenyan al Qaeda operative Saleh Ali Saleh Nabhan, aka Abu Yusuf, who is wanted by the U.S. Government for his involvement in the 1998 African embassy attacks and 2002 Mombasa attacks. The video was posted on militant forums Saturday by the Global Islamic Media Front, a shadowy and virtual media distribution unit with known cells in Europe and North America. The video, titled “March Forth,” is the 8th video product produced by Shabaab since January and the first to feature Nabhan, whose face is obscured by a mask. Nabhan speaking on Shabaab’s latest tape. Image by Nick Grace. Click to view. Nabhan supervises a Shabaab fighter at a range at an undisclosed location in Somalia. Image by Nick Grace. Click to view. Nabhan fires a rifle. Image by Nick Grace. Click to view. Al-Sudani and Nabhan were indicted by the U.S. Government along with Comoron Fazul Abdullah Mohammed for planning the 1998 attacks on the American embassies in Tanzania and Kenya, which killed 223 people. They are also suspected of involvement in the 2002 attack on the Paradise Hotel in Mombasa, Kenya, which killed 14 people, and an attempted rocket attack on an El Al jet during takeoff. 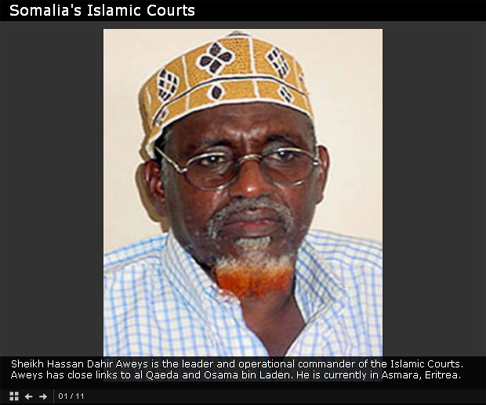 Fazul is believed to serve as the intelligence chief for Shabaab and is known to have his own vision of al Qaeda expansion in the Indian Ocean. Does anyone have an opinion of whether it is better for US interests to see Al Queda that were in Iraq or new recruits go to Somalia rather than Afghanistan? It would seem that this video is a recruitment tool that might cause Sudanese or recruits from Morroco to go there rather than far away Central Asia. I can see arguments either way. enough to the tribal areas in NW Pakistan to actually kill many of these fighters whereas our assets in Africa are much less. Thanks Nick Grace. I haven’t seen you at the Long War Journal before. I look forward to seeing future articles from you. KW64, we must remember that while we Americans are an important country, we aren’t the only game in town for AQ linked networks. In fact the large majority of the efforts of AQ linked networks are aimed at countries other than our own. Nick, could you consider writing about how the new (post Ethiopian invasion) Somali government and its civilian institutions coming along? How are the new Somali police and army soldiers standing up? How much are other countries helping with training and equipping the Somalian security forces and the civilian institutions of the Somali government?